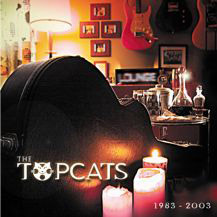 On April 11th, 2003 The Topcats released “The Topcats 1983-2003”, a double CD set with one disc featuring selected “live” recordings from the past twenty years and the other disc featuring original recordings, some live and some studio, from the past twenty years! This double CD set is produced and digitally mastered/ remastered by Buzzy Beano with art direction and design by Matt Touchard, assisted by Stephany Geiling. Addition photography by Jacqueline Cameron-Sharpe. Disc number one features “Eleanor Rigby”, “Can’t Stand Losing You”, “Telephone Line”, “Happy Together”, “Hungry”, “I’ll Be Back”, “Space Oddity”, “Pressure”, “Synchronicity II”, “Tempted”, “Great Gosh Almighty”, “Ooh Baby, Baby”, “Beds Are Burning”, “Wishin’ Well”, “Leave Your Hat On”, “New Orleans Ladies”, “Jump, Jive, and Wail”, “Shamalama Ding Dong”, and “What You Need”. 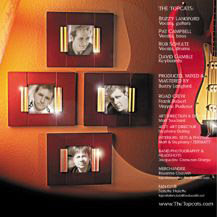 All of these song were recorded live over the past twenty years and feature the sound engineering capabilities of Frank Robert, Joe Porter, and Kenny Nestor. 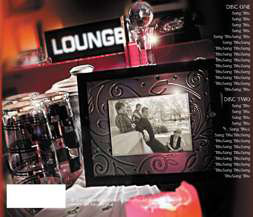 Disk number two features “Friends, Money, and Love”, two versions of “This Crazy World”, “Ladies of The Eighties”, “Break Another Heart”, “Calling On You”, “Playing With Emotion”, “Rich Girl”, “Did You Think That I’d Tell You The Truth”, “Be With You Tonight”, “Main Attraction”, “Pictures of You”, “Sanctuary”, “Foolish Me”, “Clocks”, “Follow You Down”, and “Circus Girl”. These are all original songs who’s recordings span the past twenty years! 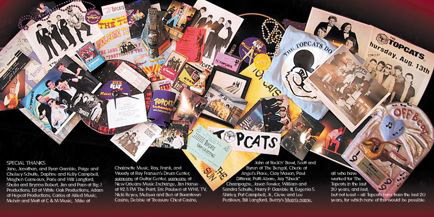 Included are early versions and alternate mixes of already releases material, as well as Topcat songs sang by Sal Candilora and Don Berry, who both sang with the band in the 1980’s! Check out the songs below. “Eleanor Rigby”, recorded in April of 1984, and “Jump, Jive, and Wail”, recorded October of 1999, are examples from disc one and “Friends, Money, and Love”, recorded in April of 1984, and “This Crazy World”, recorded in December of 1984 are from disc 2.